We appreciate your service and contributions to keeping America safe. To show our gratitude we are offering a 10% discount for all military members. 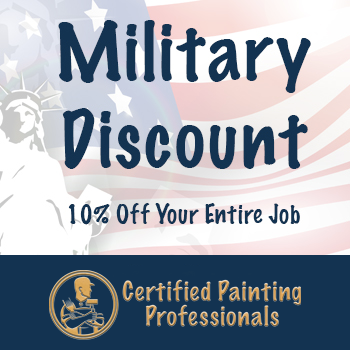 Get 10% off your entire job when you show us your military ID. Don’t wait, make your dream a reality. Disclaimer: *Current promotions cannot be combined with other coupons, Groupons, or discounts. Can food drive cannot be combined with Groupon promotion. Promotions are valid through April 30, 2019. Military discount are for those who can show proof of service. Other restrictions may apply. Certified Painting Professionals is a family owned company that is located in the Greater St. Louis area that specializes in interior and exterior painting for homeowners and businesses. If you are currently looking for a painter in the Greater St. Louis area, give us a call at (618) 560-7030.